One of the biggest and most anticipated events in the franchising industry is set on October 3–5. 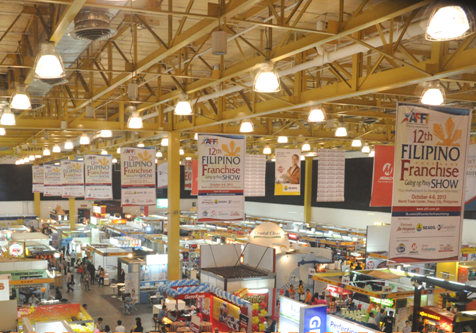 AFFI expects hundreds of franchisers and suppliers along with thousands of aspiring entrepreneurs to take part in its 2014 Filipino Franchise Show. <>The Association of Filipino Franchisers Incorporated (AFFI) is all set to hold their annual Filipino Franchise Show. This year, AFFI has invited franchisers from all over the ASEAN region to participate in the show as part of efforts to prepare for the ASEAN integration slated for 2015. Ricardo Cuna, owner of Fiorgelato ice cream franchise and head of this year’s show committee says, “This year we are inviting franchisers from all over ASEAN to showcase their homegrown concepts to explore the possible synergies between local and regional franchise brands.” Franchising is one of the industries set to be opened up as part of the integration and is expected to lead to an influx of foreign franchise brands in the country. He adds that the franchising industry is expected to continue posting double digit growth and is expected to see the entry of more new players. “We are seeing more and more emerging concepts and startup businesses joining the show, which shows that the industry is still and will likely continue to grow,” Cuna asserts. AFFI is one of the largest industry bodies in the Philippine franchise industry, counting among its members local brands such as Aquabest, Binalot, Figaro, Lots' A Pizza, Sweet Corner, among others. The show is considered one of the biggest events in the Philippine franchise industry. It attracts thousands of aspiring entrepreneurs who come and see hundreds of the country's top franchise brands. Apart from an impressive roster of participating franchise brands, the show also features companies from allied industries and suppliers. Among the major sponsors for this year’s show are BPI Family Ka Negosyo , Seaoil Philippines, St. Francis Generic Drug, and The Generics Pharmacy. AFFI is also set to recognize the outstanding franchise companies and franchisees through its annual AFFI Enabler Awards and Galing ng Pinoy Franchise Excellence Awards. The show would also feature seminars and workshops for aspiring entrepreneurs and franchisers to be facilitated by several AFFI members, as well as BPI Family Ka Negosyo and the Intellectual Property Office. Supporting AFFI in its advocacy to showcase the very best of Filipino franchise concepts are its sponsors and partners St. Francis Generic Drug, Globe My Business, Farmacia ni Dok, Geepas Philippines, 2Go Express, Revelnet, My Basic Graphics, Philippine Daily Inquirer, Business World, Business Mirror, Entrepreneur Philippines, United Daily News, Carl Balita Radyo Negosyo, United Neon, Meralco, Go Negosyo, IPO, DTI BSMED, and TESDA. 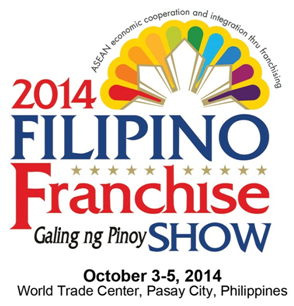 The 2014 Filipino Franchise Show will be held from October 3 to 5 at the World Trade Center. For inquiries please contact the AFFI Secretariat at (+632) 654 0345, 09228149881 to 82 or email affifranchiseshow2014@gmail.com. You can also contact PETCO at (632) 832-9303 to 05 or email secretariat@petcogroup.com .